The workplace today is different from what it was like 10 years ago. It will continue to change and will be very different five or 10 years from now. As a result of this continuous change, the workplace presents new challenges for effective managers. There are at least three ways that the workplace has changed or is changing: architecture, technology and community. Architecture. Twenty or more years ago, office walls came down as workers were moved into cubicles. It was claimed that cubicles made the workplace more flexible and allowed for greater worker interaction. Employees’ concerns about their privacy and ability to do their work were overridden by organizational concerns for efficiency. 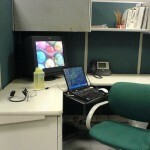 Now, cubicles have given way to open spaces. Even cubicle walls are eliminated. There are open and flexible spaces for employee use at any time and “neighborhood clusters” in which people working on a project can hang out for a while. Open-space offices are particularly attractive to Millenials, especially when coupled with the latest technology like networking, laptops instead of desktop computers and other technologies that allow people to work at a variety of times and places. Managers in open-space offices must pay attention to concerns of workers who need or demand more privacy. How will this be addressed? How will new arrangements between workers be structured? What kind of meeting space will be required, especially for meetings of only a few people that used to occur in offices? Are there situations where open space is inappropriate? Will managers still have offices? Technology. Desktop computers are becoming less common. Laptops, tablets and smartphones allow workers to take their “desks” to meetings and other locations. The flexibility afforded by these new devices is accompanied by a concern for how they are used and how to ensure their security. Social media is growing. More well-known channels like Facebook are being abandoned by younger workers, who consider Facebook as the virtual space where “older folks” (those over 40!) hang out. Whether Facebook or some other site, social media have changed the way we relate to one another and the way that work is done. Managers in this new workplace must remain current on technological changes. They must take into account how technology transforms conversations and information inside and outside the organization. What are the rules for off-duty use of computers? How do these interface with First Amendment rights? What does accountability look like in an era of social media and cell phones? How is customer service different when feedback is given via Facebook or in another virtual venue? Should the agency have a Twitter account? If so, who controls the postings and hashtags? Community. Today’s workplaces are often considered “second families” or communities. Companies judged as “best places to work” are those that provide supportive relationships and collaborative work settings. Workplaces are called upon to be safe places – from violence, family stress and other social and economic worries. They are places that encourage and support health and healthy practices. Best workplaces help employees to practice communication and conflict management skills that they can use in the home and marketplace. They recognize what employees have in common, beyond the specific professional skills they bring. They are democratic places, where individuals experience empowerment. Time spent designing community creates a “social platform” which can facilitate organizational activities and community wide efficacy. In these workplaces managers must be skilled in sharing power and decision making. They must create organizational mechanisms like open-book management that allow employees to understand the work and finances of the agency. They must be, in a sense, community organizers, or be able to identify someone who can accomplish this. The people needed for this workplace. Managers must recognize experienced workers’ concerns, as well as recruit and support younger workers. Using the talents of workers, quite apart from their work skills, allows managers to develop responsive strategies. The State Department, for example, asked young people to develop sites intended to challenge and counteract extremism. This peer-to-peer model reflects the way in which younger people are accustomed to working. A police department called upon people with hacking skills to develop protocols for managing videos from cop cams. An employee who regularly tweets might be just the right person to head up a Twitter account. A Postscript. All of the above is difficult. It requires all employees to be flexible and open to change. It requires people with technological skills. It requires expenditures not included in the current budget. New spaces, new technologies and new communities. All difficult to learn and adapt to, but absolutely essential if government is able to meet 21st century challenges.